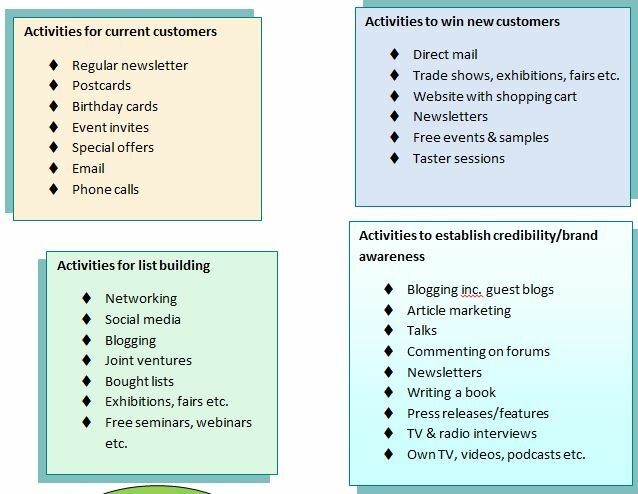 An excerpt from ‘My Marketing Plan’ with some ideas for list building. Every business needs to generate leads. Without leads we won’t get new customers and without new customers our businesses will fail. I’m fairly confident that this is something we can all agree on but do we need quality or quantity when it comes to new leads? Judging by some of the behaviour I see I suspect we may have different views. As an experiment I recently took part in a Fan Page event on Facebook designed to create reciprocal likes for our business pages. I picked up a few new contacts for which I am grateful but I feel slightly guilty that I didn’t ‘like’ everyone back! It’s not that I disliked anybody but some are just not relevant to me. That brings me back to my question about quality or quantity. As I live in London, England I am not going to buy D-i-Y materials from Texas! I might however buy some distance learning materials from New Zealand. I will therefore be interested in communications from distance learning providers wherever they are but a grocery store needs to be on my doorstep before I want to know more. This is something we all need to think about when planning our lead generation strategies. In my view the D-i-Y store needs to focus on building relationships with local people who have the potential to become customers. This is the same whether the networking is online or off. In this case quality rather than quantity matters. This store needs to engage with people in their local area who do D-i-Y, they only need a global audience if they have the means to sell globally. So the first step in any lead generation strategy is to determine who we serve. Who are our target customers? Where do they live? What use do they have for our services? When you are really clear about who you are targeting then you can find out where they hang out and join them there. Then you can start conversations that your audience will wan to participate in. There are many experts out there who will tell you it’s all about adding people to your ‘list’. If, like them, you are in the information marketing business this is true. It might also be true for website developers, virtual assistants, copywriters, marketing agencies etc. but then again it might not. The second question you have to ask is how many customers can you cope with? If you are a one woman web developer or a one man copywriter there will be a limit to how many customers you can cope with at any one time. The last thing you want to do is disappoint people at the first point of contact. You will need to understand your numbers and manage your list accordingly. What percentage of prospects become customers? How long, on average, does it take to convert a prospect into a paying customer? The answers to these questions will help you to determine how many people you need on your list. You also need to know what kind of people they should be but that’s another article! If you need help to generate more leads why not book yourself on to a free half hour no obligation call to see if I can help you. Book here. This entry was posted in Marketing, Networking, Small business advice and tagged Business, Customer, Facebook, Lead generation by glendashawley. Bookmark the permalink.